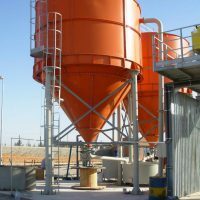 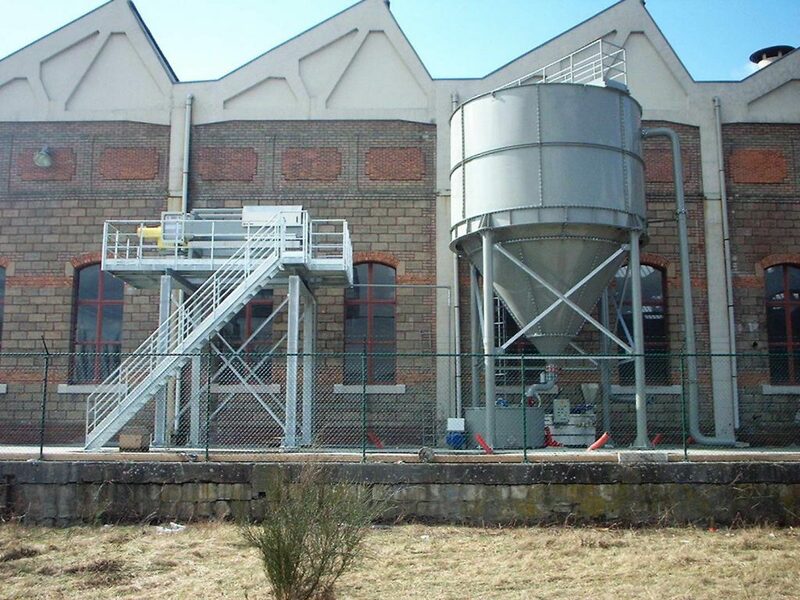 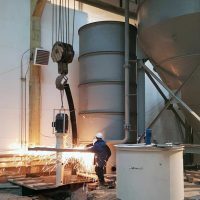 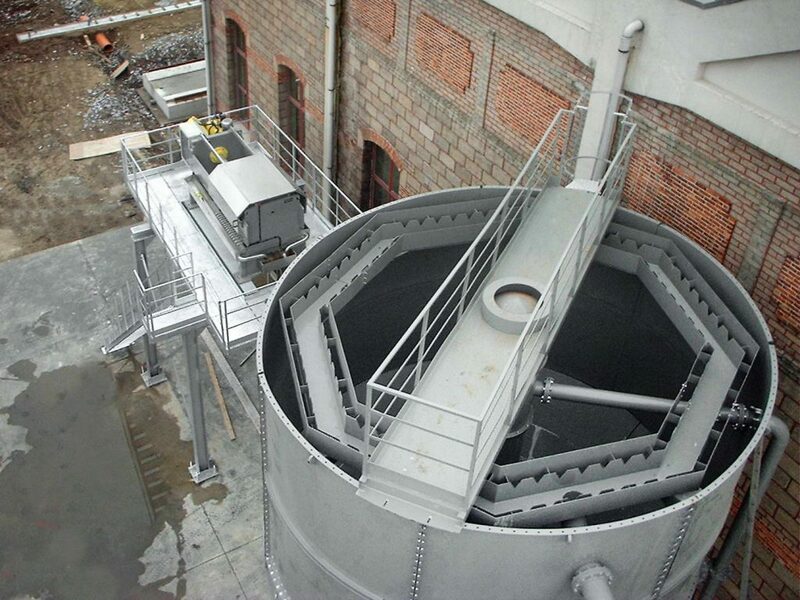 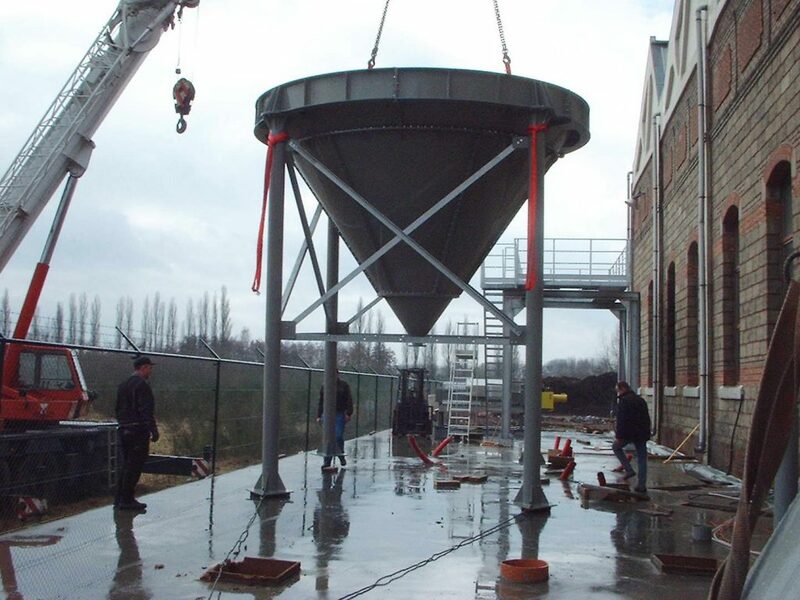 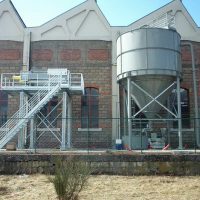 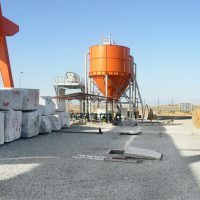 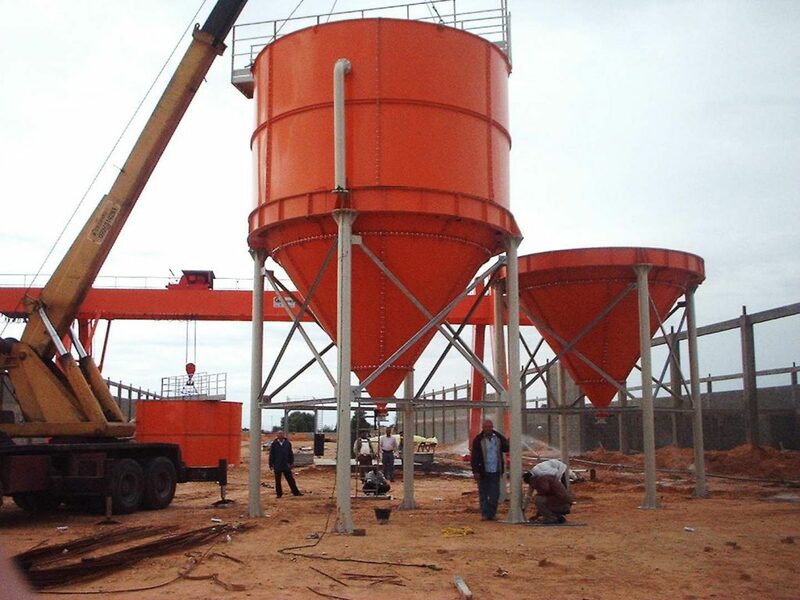 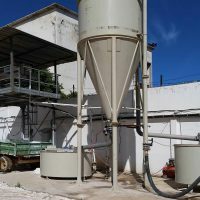 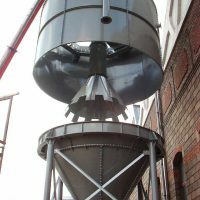 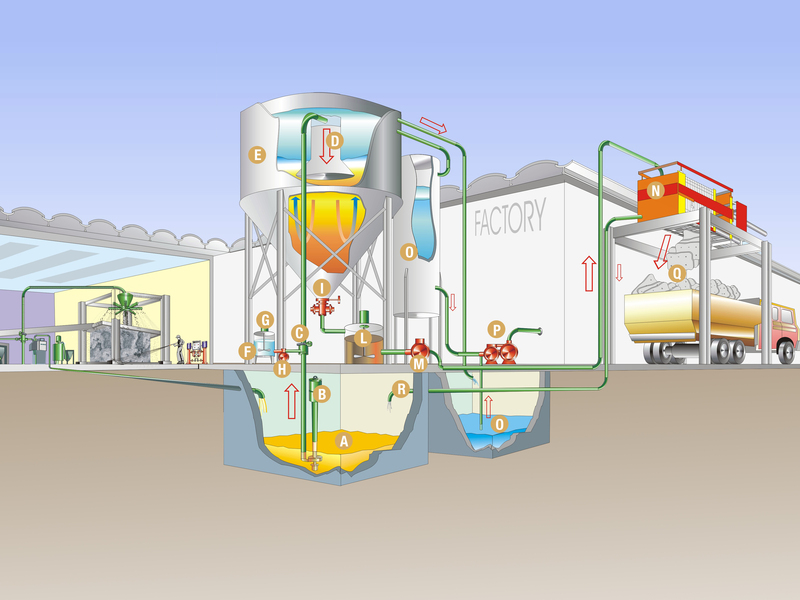 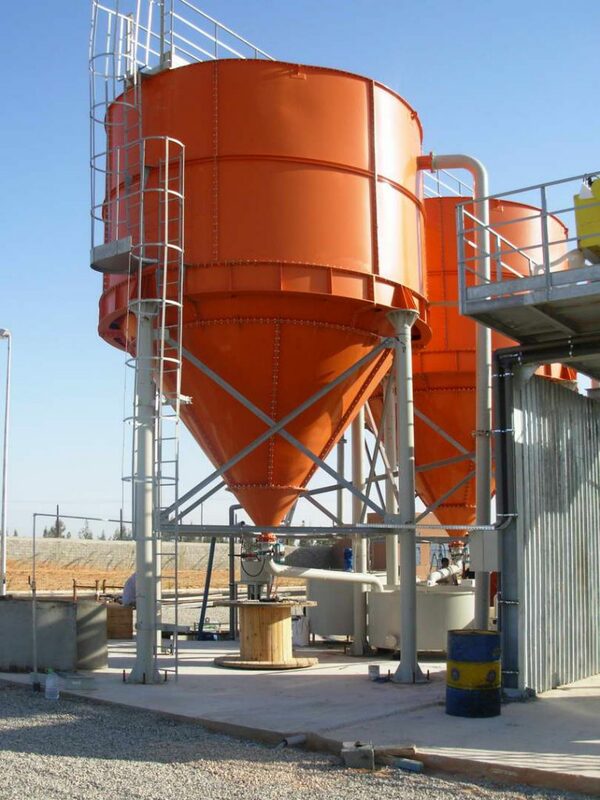 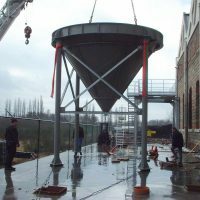 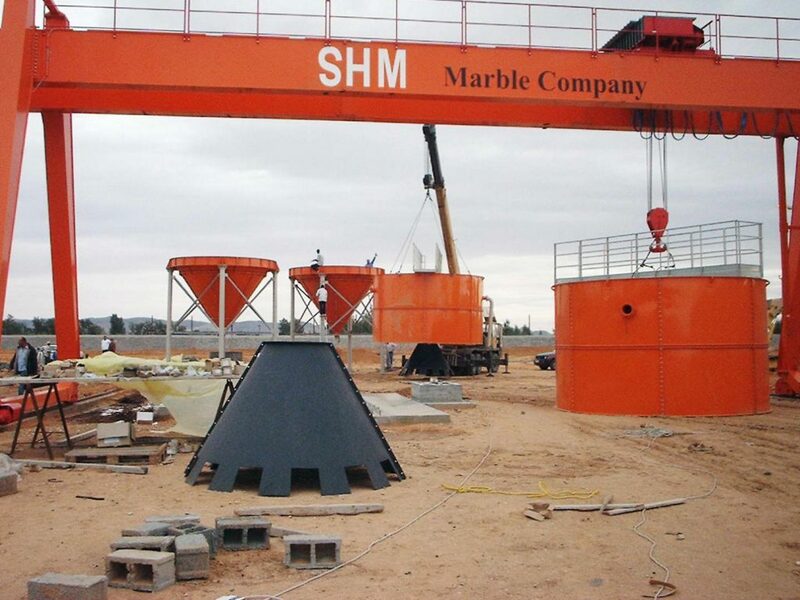 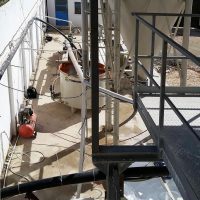 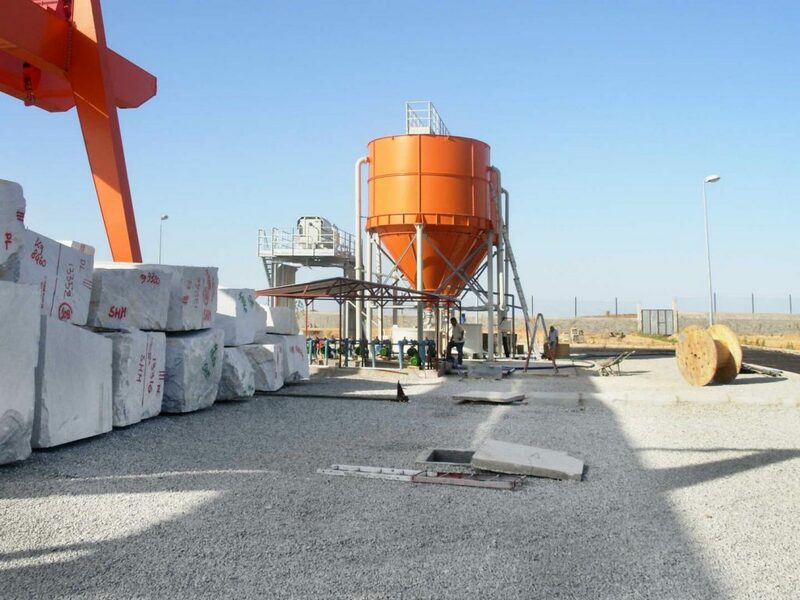 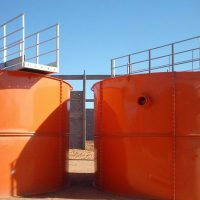 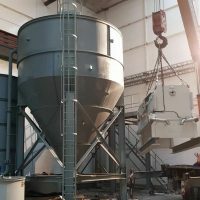 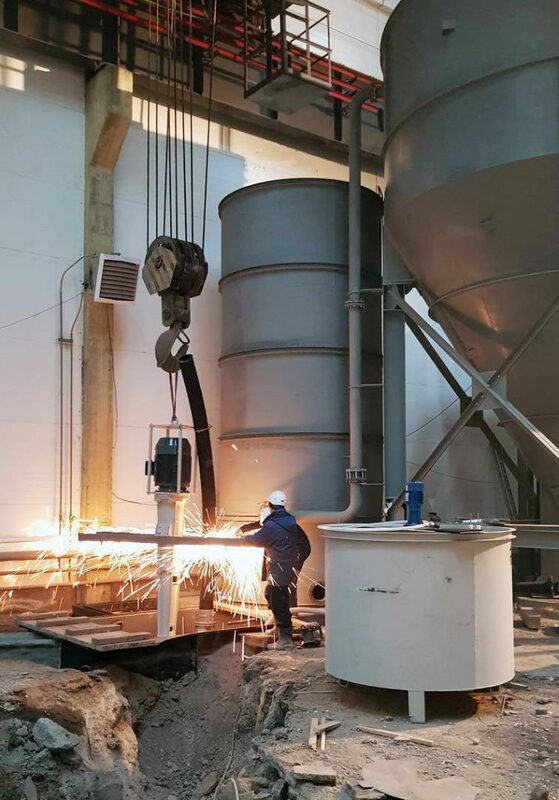 Narana plants are complete treatment plants for the clarification of waste water by means of static settling silos and for the dehydration of industrial sludge, coming from the processing of inert or other process, by means of a filter-presses. 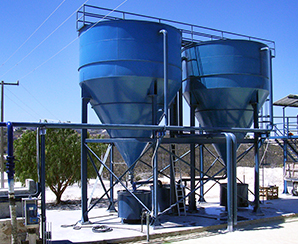 Narana plants are suitable for such companies that need to treat large flow rates and have no particular space problems. 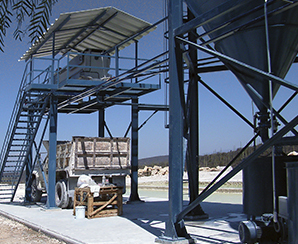 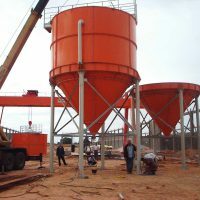 Tesimag designs each plant according to customer specific needs, ensuring maximum performances for each type of sludge. 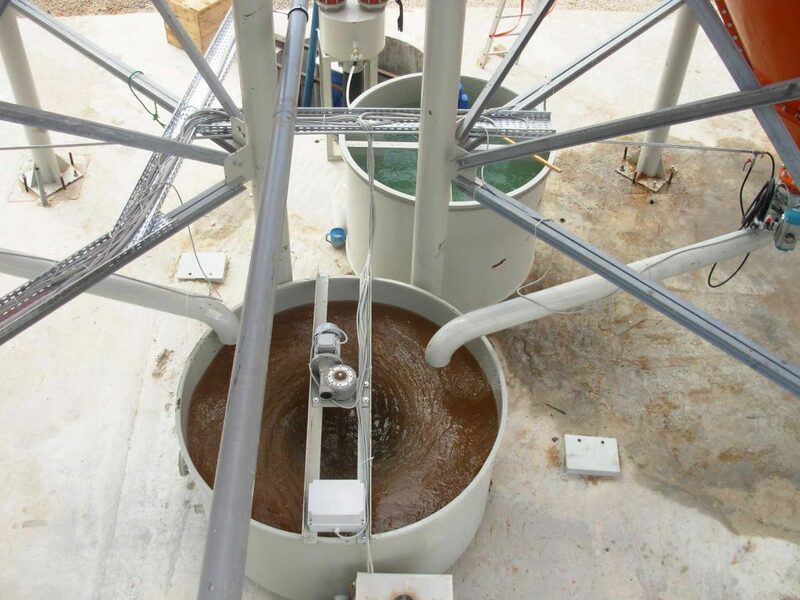 The water resulting from the working cycle is clarified by a sedimentation process of the mud suspended particles by means of specific polyelectrolytes. 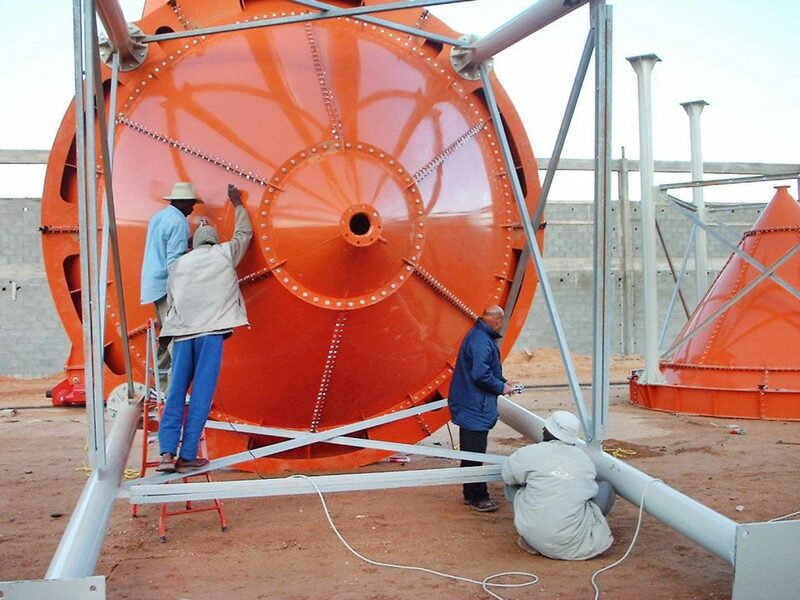 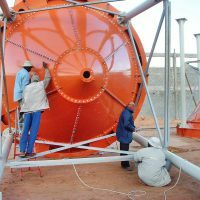 The waste water is conveyed into the collecting well A, from which they are sent to the silo E, by means of a vertical centrifugal pump B, automatically controlled by level probes. 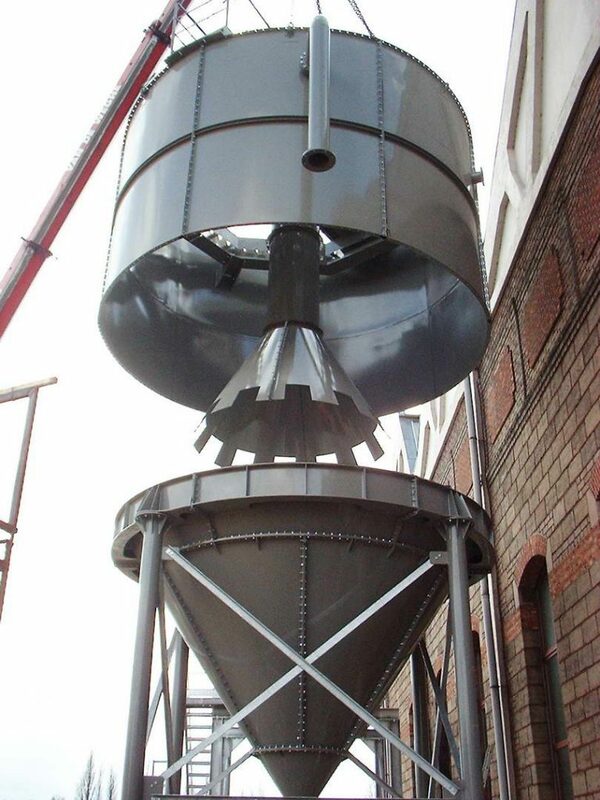 The flocculant solution, obtained by the flocculating preparation unit G, is injected by means of a metering pump H into the silo waste water inlet pipe. 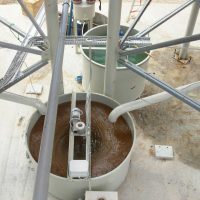 Inside the silo the mud, trapped by the polyelectrolytes, falls towards the bottom of the clarifier, thanks to the cone D placed inside it, which accelerates the fall and at the same time prevents its flow. 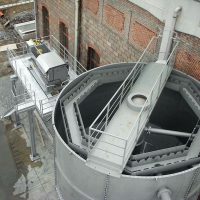 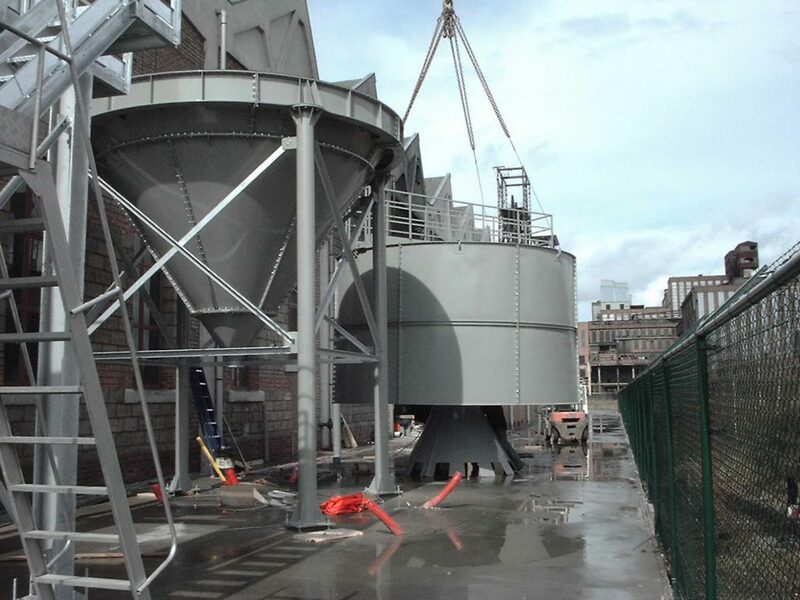 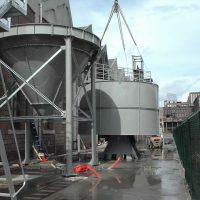 The clarified water overflows from the silo and is collected in an appropriate storage tank (or in a collecting pool) O, to be sent back to the working process by means of a boosting pump P. The sludge that is conveyed in the lower part of the silo is discharged by means of a pneumatic valve into a mud collection tank L complete with a stirrer designed to obtain an homogeneous mixture. 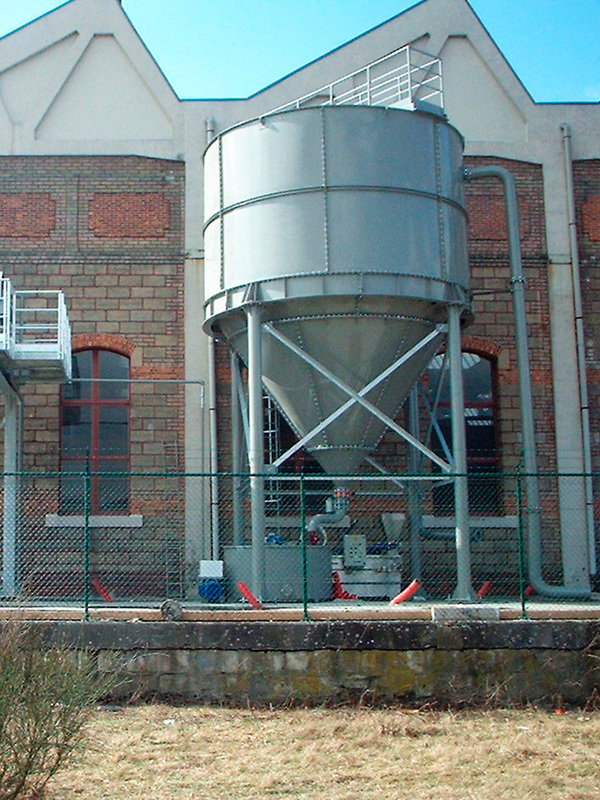 An horizontal centrifugal pump M, send the sludge to the filter press for dehydration. 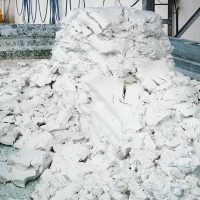 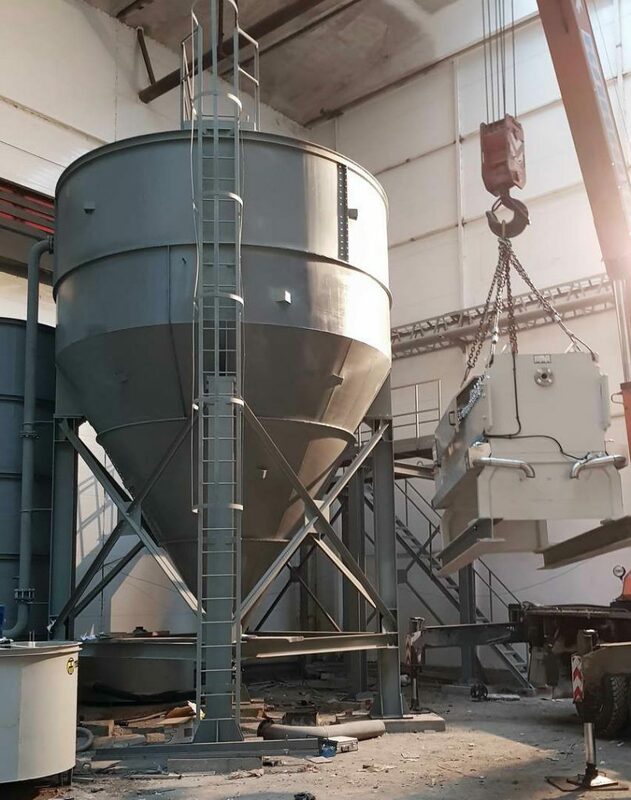 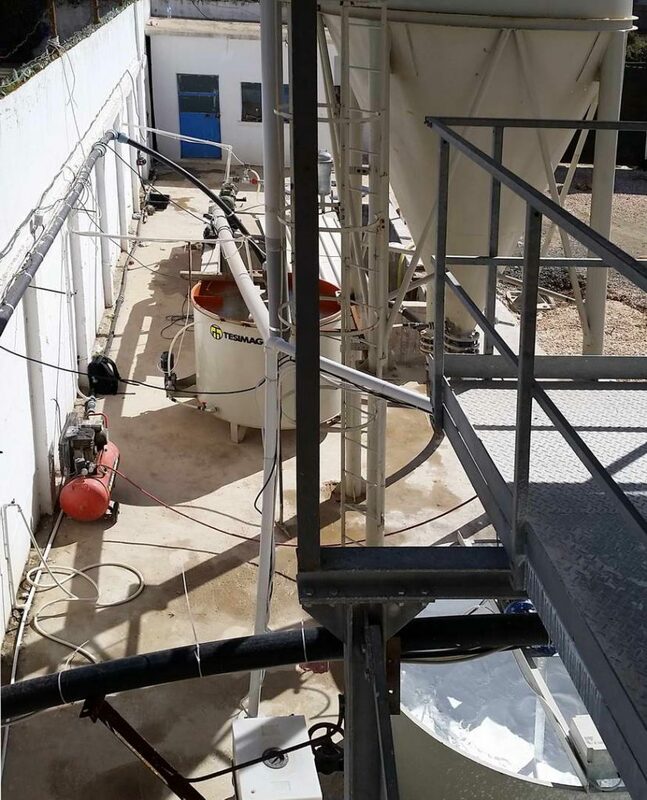 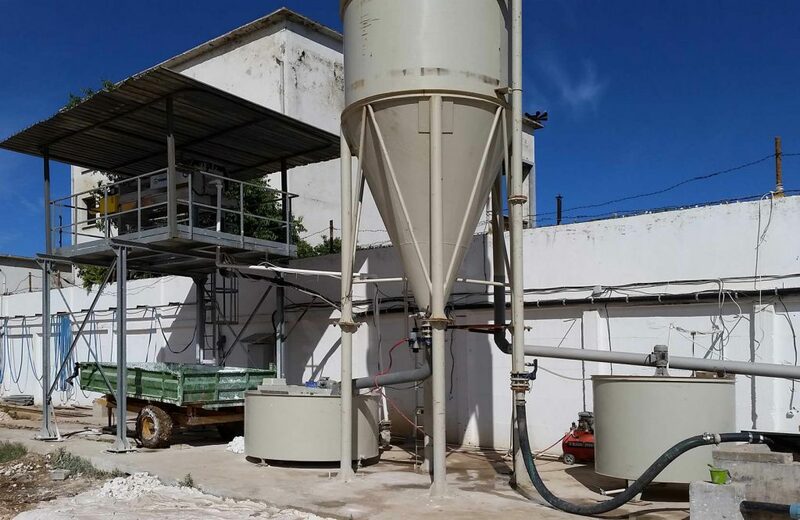 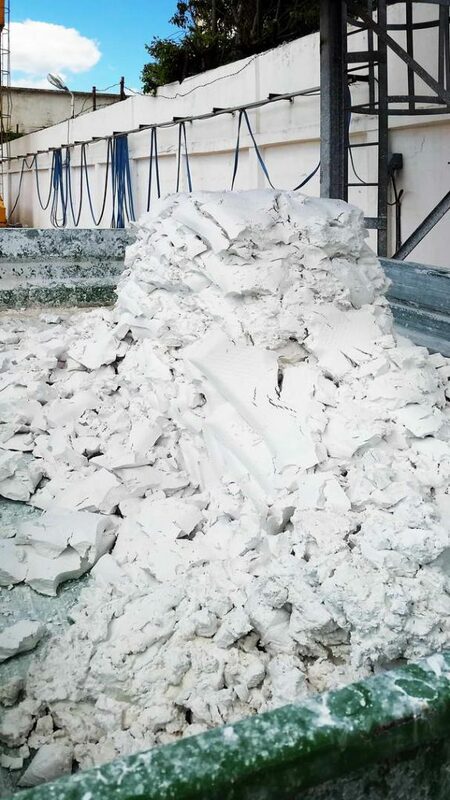 The water obtained from the filter press is sent back to the clarification process while the dehydrated mud panels are collected for disposal. 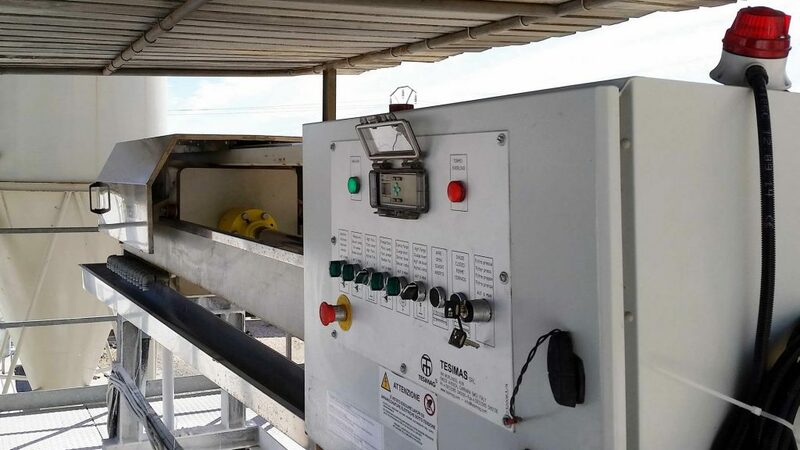 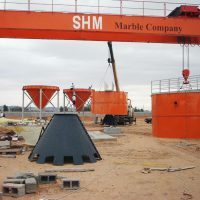 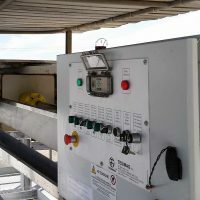 The plant, which operates in a closed and continuous cycle, is managed in complete automation by a centralized control system and does not require any intervention by the operator. 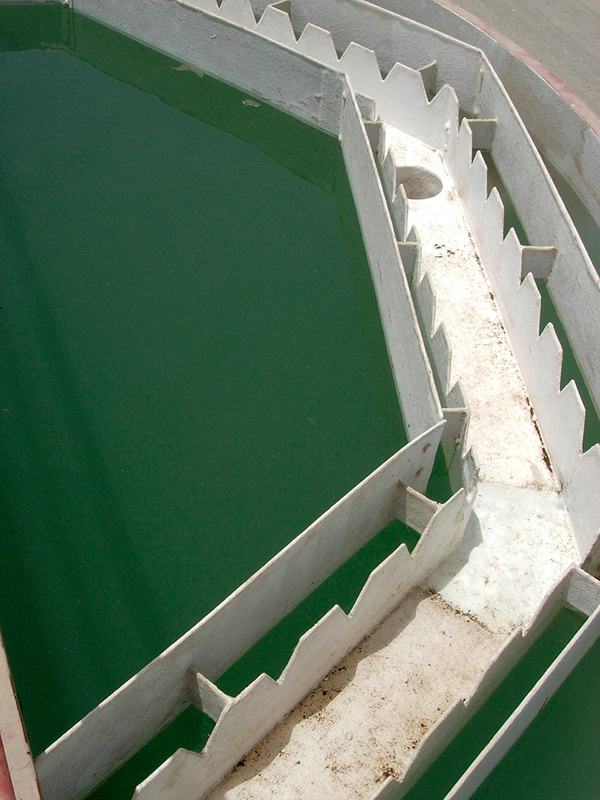 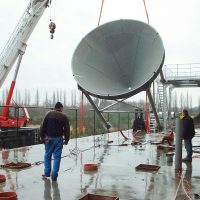 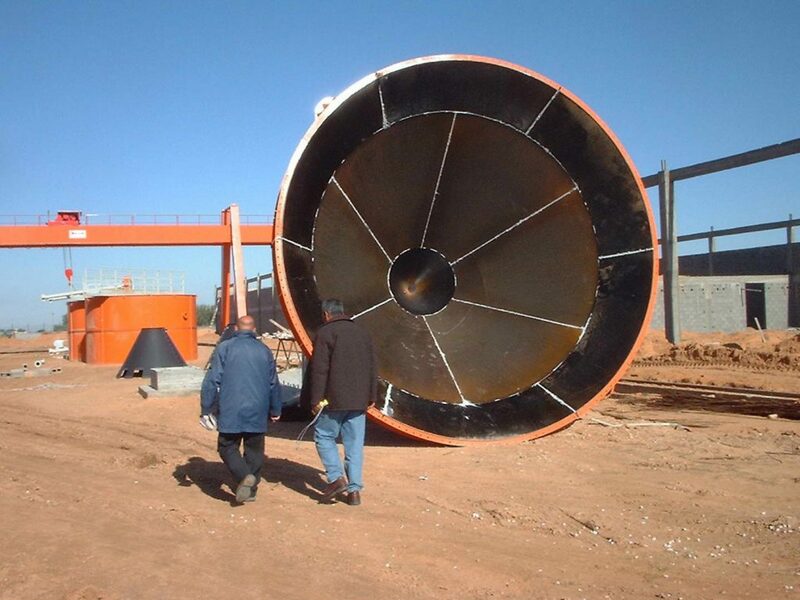 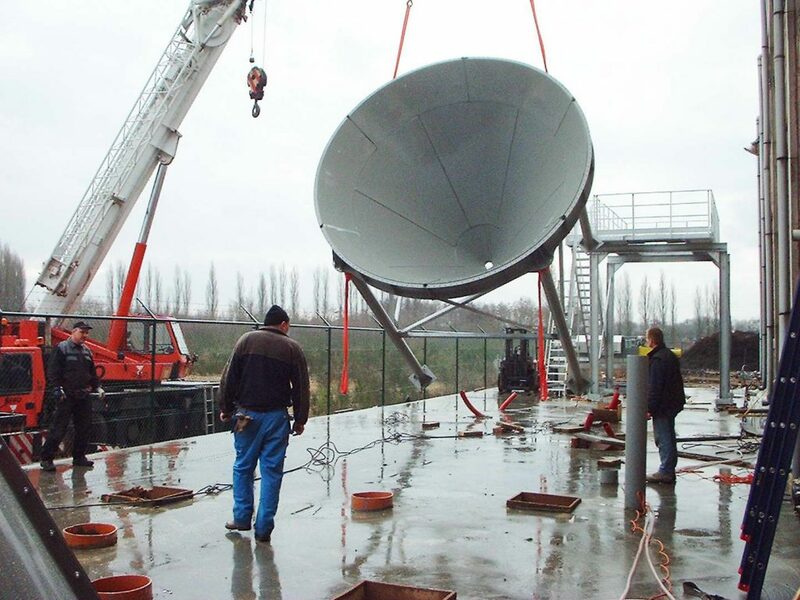 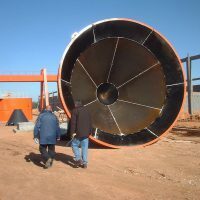 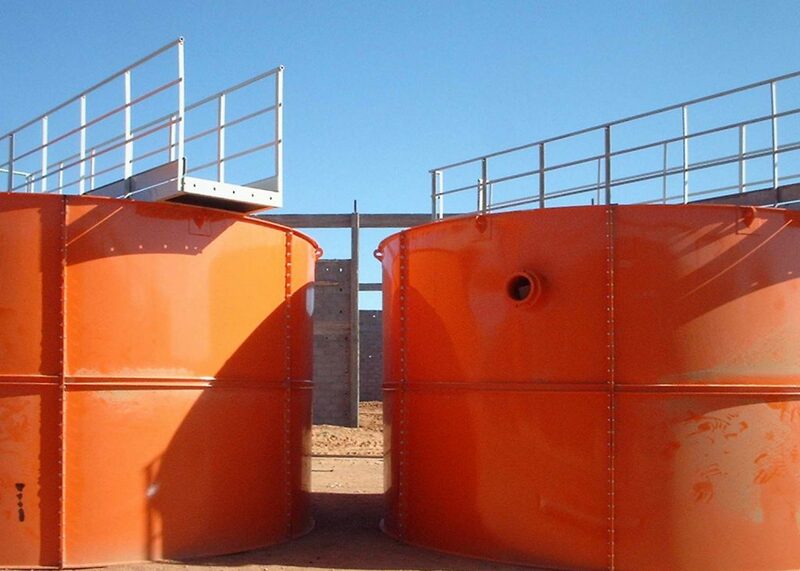 This allows to optimize the filtering process and minimize the fresh/aqueduct water supply.